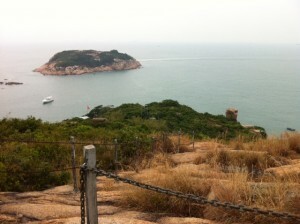 The peak is probably the most known sight seeing spot in HK. If you are first time in Hong Kong, you can combine visiting the Peak with hiking. 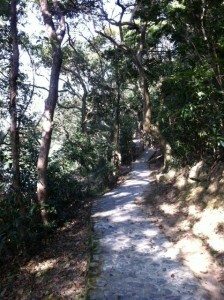 The hiking route is from the Peak to Pok Fu Lam Reservoir, which is about 2-hour walk. 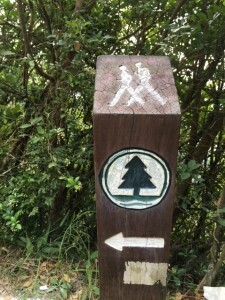 This route is actually a section of the so-called “Hong Kong Trail” and therefore all the way you will be guided by the “Hong Kong Trail” sign and will not get lost. 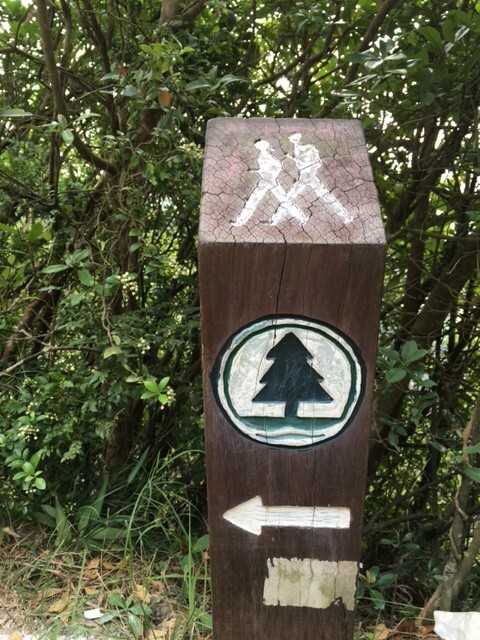 The walk is easy too, good for family with kids. 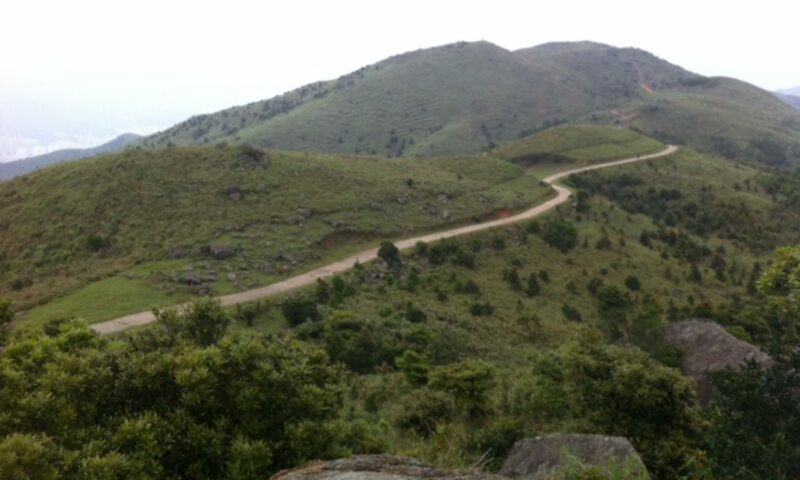 The “hardest” part is probably the last part comprising gentle downhill. 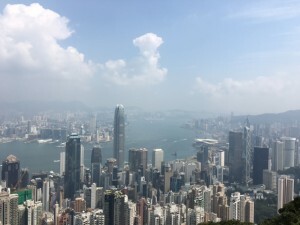 All in all, it is an easy walk and you can have a bird’s eye view of the Victoria harbour and city during the first part of the walk. Starting point: Find “Lugard Road” which is at your right side once you leave the Peak Tower, and the “Hong Kong Trail” sign also appears. 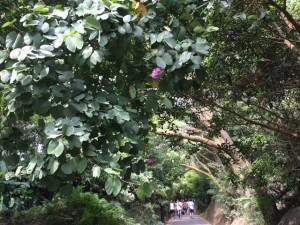 The walk is indeed very leisurely. The road is paved and shady, flanked by trees, and the city simply unfolds underneath as you saunter. There is an intersection after about 1 hour. 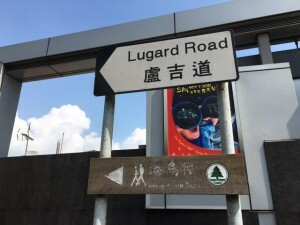 Please turn right here into the Harlech Road towards Pok Fu Lam Reservoir. The walk from now on is mostly downhill and it is more fun as it is a dirt / stone path instead of a paved road, feeling like hiking in the woods. Towards the end, after a long flight of stairs you will reach the small Pok Fu Lam Reservoir, which was the first reservoir in Hong Kong, dating back to 1863. Once you reach the reservoir, Pok Fu Lam Road is just around the corner (just turn right if you face the reservoir and it will lead to Pok Fu Lam Road) and there you can find buses in all sorts of direction including going to Central. 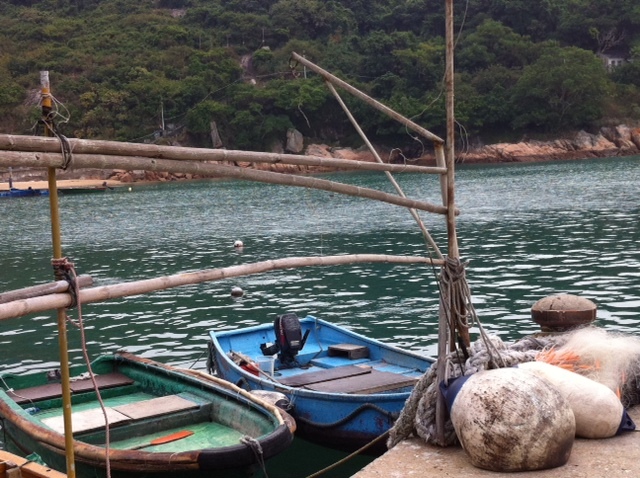 The hints about HK’s political realities are everywhere along the route, if you care to look. 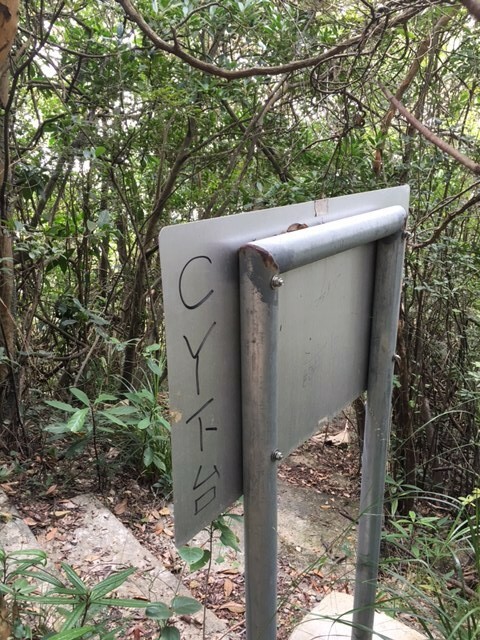 A slogan was painted by hand on a stand, which says “Downfall with CY”. CY is HK’s very unpopular Chief Executive, who was late for a function in London earlier because he said he was so moved by the Chinese national flag he saw he had to get off the car and show respect, leading to the delay. 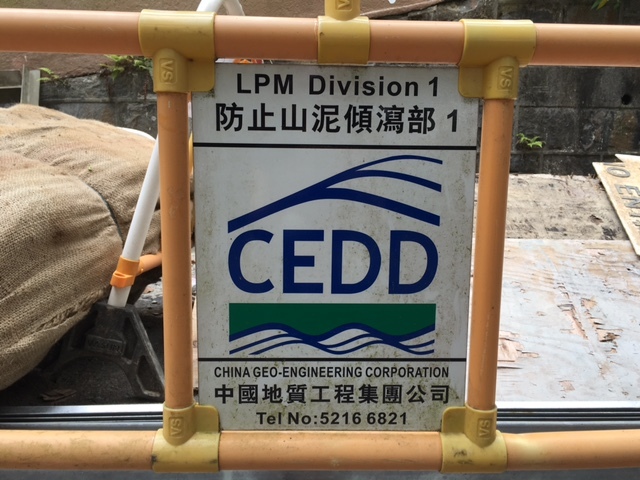 And you know what, the city’s main government contractors making big money are now all mainland companies, including the contractor for prevention of landslides in the Peak. 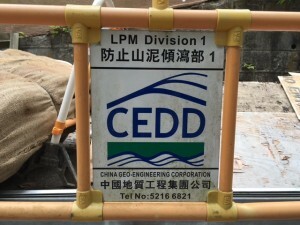 This sign says it is “China Geo-engineering Corporation”. 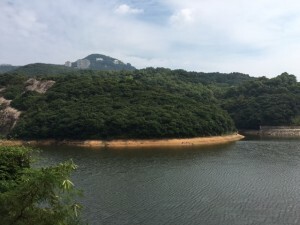 Lau Shui Heung Reservoir (流水響水塘) has long lost its irrigation function for agricultural lands nearby as Hong Kong’s farming lands have become a rarity. 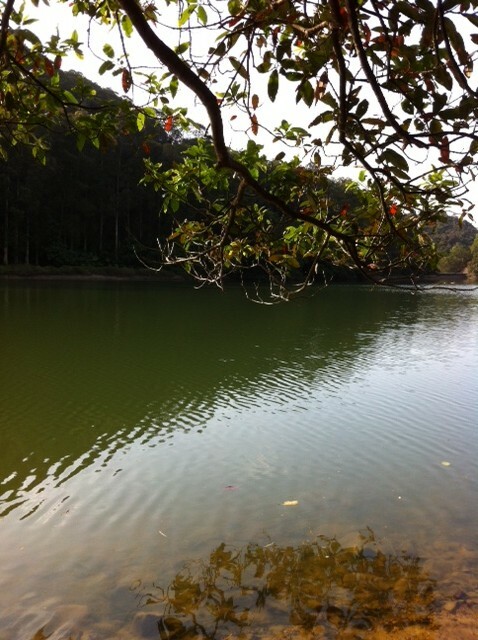 But the biodiversity there plus the picturesque scenery has made the reservoir area a lovely place for leisure walking. There is not a path along the reservoir, but a country trail starts from and ends at the reservoir which is about 2-hour walk. The walk is pretty easy with very mild climbs and has alternative dirt, stone and concrete trail. 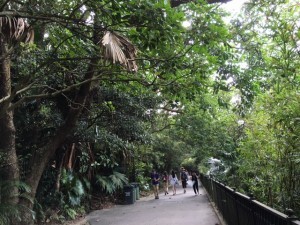 The middle part of the trail is concrete, after you reach an intersection and a pavilion. Follow the sign pointing to Tai Po Road, and go down the slope a bit, before turning right, when you see this sign, into a nice dirt path leading to the reservoir. This last part of the trail in the reservoir area is very green and captivating. 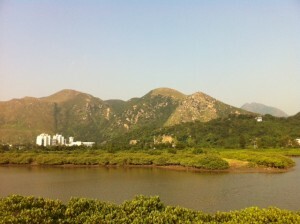 The easiest way is take a taxi, with a fare of about HK$60, from Fanling train station. Alternatively, you can take minibus No. 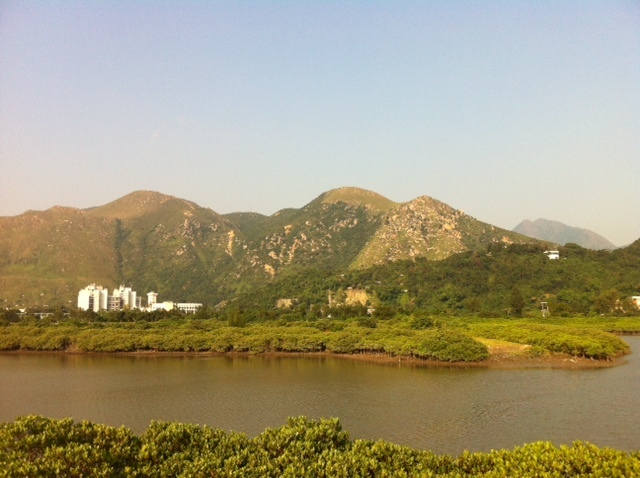 52B, from Fanling train station, the services of which are far from frequent. 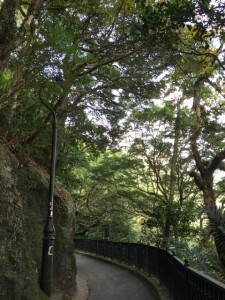 Get off at the junction of Lau Shui Heung Road and Hok Tau Road, and walk along the Lau Shui Heung Road towards the reservoir. 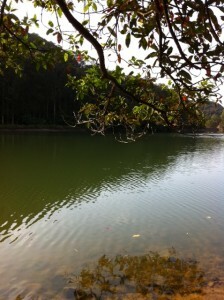 Or simply tell the minibus driver to drop you off for going to Lau Shui Heung Reservoir. To return to Fanling train station, since it would be hard to hail a taxi, just walk back to the junction, and along the Hok Tau Road towards Hok Tau. You will pass by a BBQ site (Hok Tau BBQ Area) on the way. 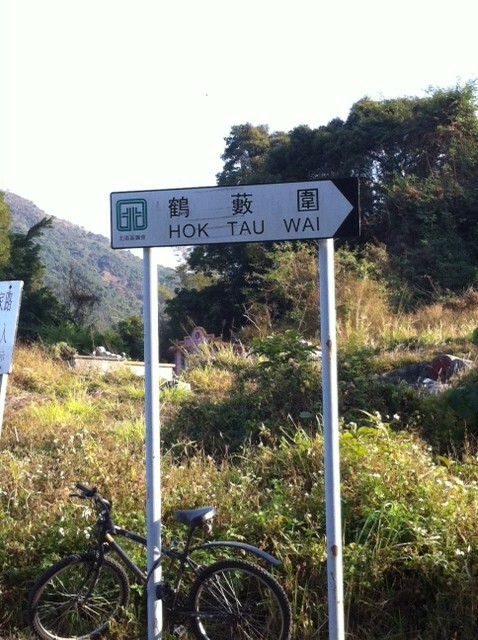 When you see this road sign pointing in the direction of Hok Tau Wai, follow it and the bus stop for No. 52B will be in sight. But be prepared to wait at least half an hour for the minibus as the services are not frequent. 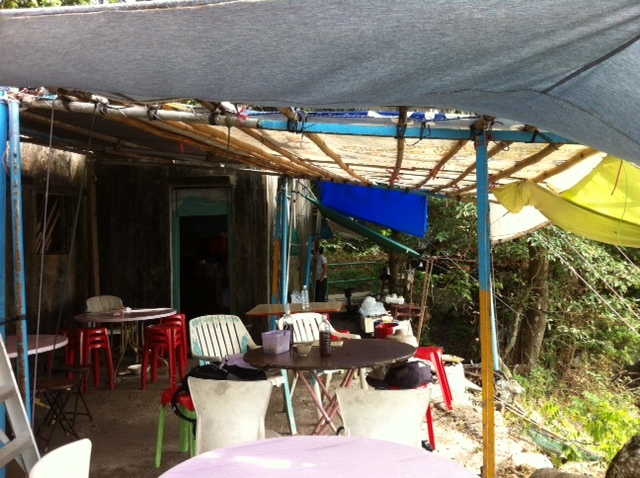 Just next to the road sign (Hok Tau Wai), is a store selling noodles and desserts with outside seating. 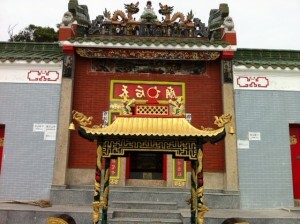 Its bean curd dessert and sweet potato dessert are excellent. Give it a try before heading back to the city. 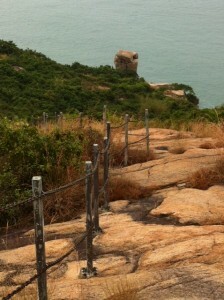 If you do not wish to go for the rugged trail as described in Part 1, try this easy trail on the Island. 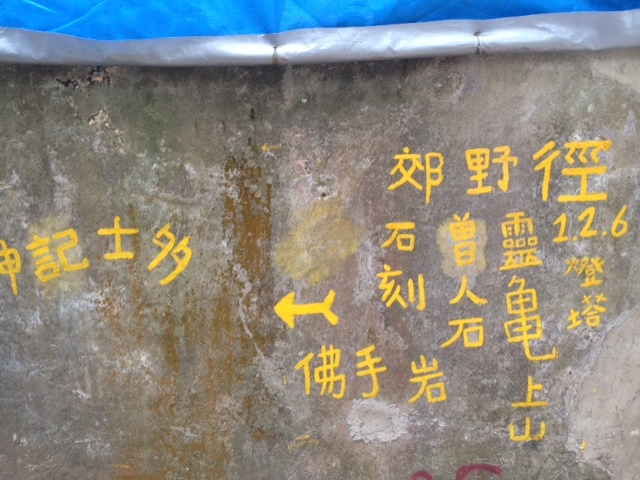 After leaving the pier, turn left and not far on your right hand side, is a narrow path between houses with such handwritten words on the wall, indicating a path leading to country trail: Follow the path and you will come across a dessert restaurant called Kun Kei Store (坤記士多). Be brave to walk through the open restaurant – the owners may call out at you to sit down for some dessert soups. You will soon be on a paved trail to see ancient rock carvings of some three thousand years and some of the famous rock formations on the Island, as well as a light house. 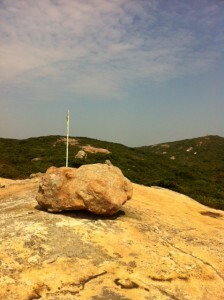 The rock cravings on the Island are declared monuments in Hong Kong, discovered in 1960s. Two groups of cravings, wearing off, are visible. As I had to meet the 4pm ferry time to leave the Island on the day of visit, I had no alternative but headed back to the pier before reaching the light house. 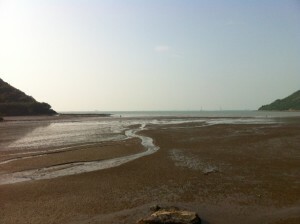 As you can tell, the Island is interesting enough for exploration more than one day. I promised myself I would come back. Before boarding the ferry, there was still a little bit time. So I was using the time to find out what I could buy from a store near the pier, run by an old couple who sold herbal tea, seaweed, dry fish, etc. 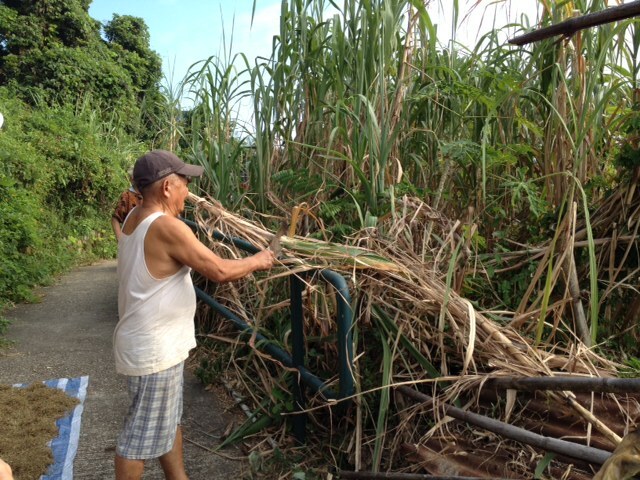 It seemed that they sold everything, even a sugarcane for $10, fresh from the field. 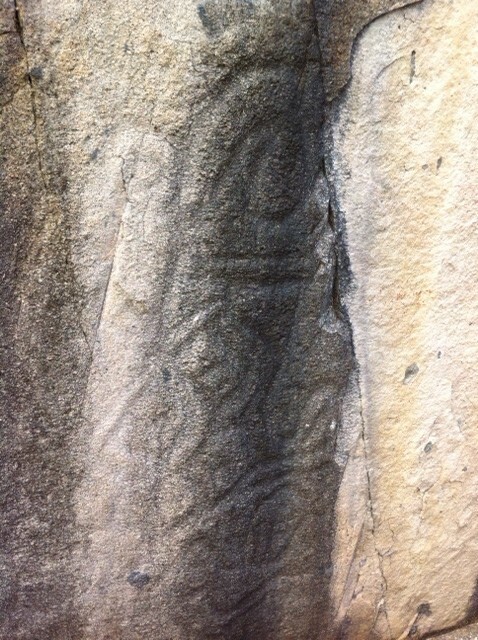 There is a moving humanity touch about the Island. The couple dried herbs on the ground and sold them as slimming herbal tea. 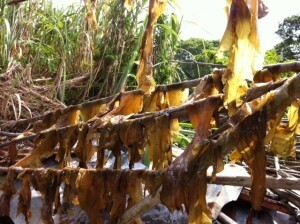 They also dried fish in the open. 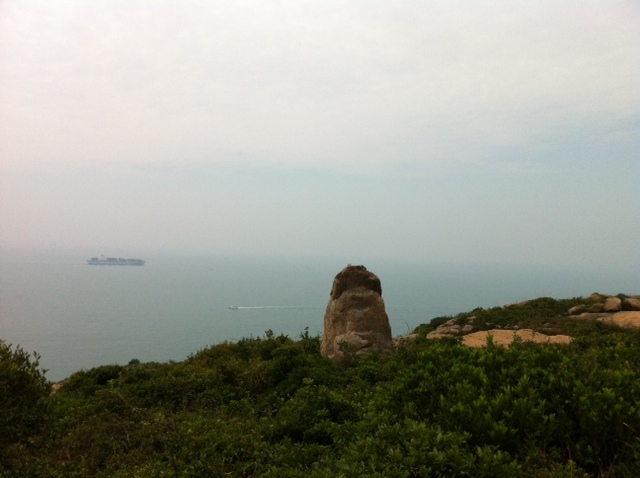 Strangely, for such an enchanting island, I did not visit it until recently. 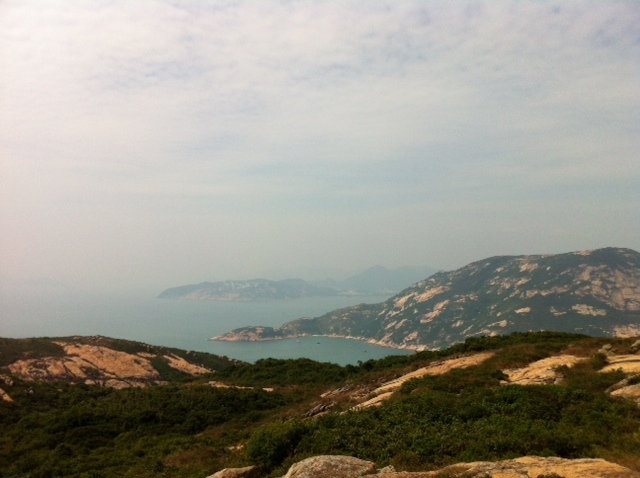 It captured my heart when I began to climb its hill. 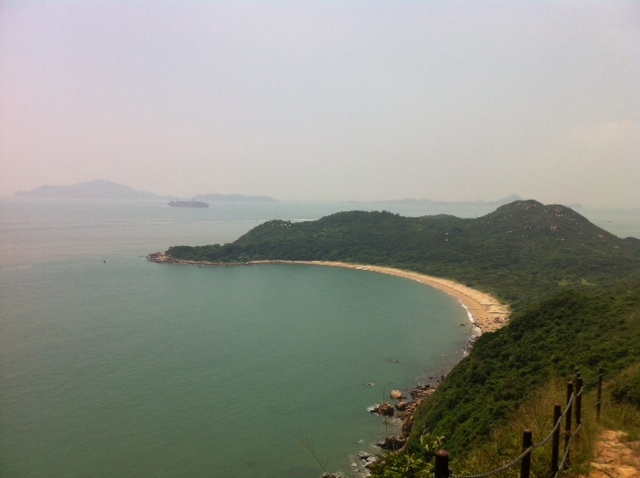 I started from Tin Hau Temple (turning left after leaving the pier). Near the temple, there is a rugged trail with metal chains as handrails along the way. The climb was extremely interesting and a bit exhausting with spectacular view meeting your eyes. 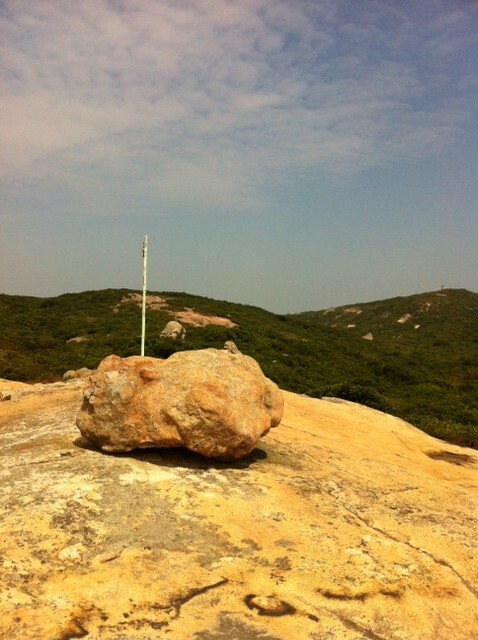 Dotting the way are some fascinating rock formations for which Po Toi is famous, as well as signposts ensuring that you will not get lost. 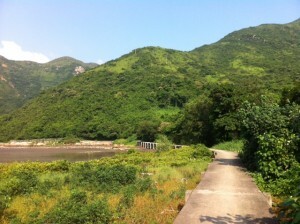 After about 1.5 hours of walk, you will come to an intersection with a pavilion at not far distance. You can either go up to the pavilion and walk a longer distance before heading back to the pier, or go the easier route which will take you to the pier in half an hour. 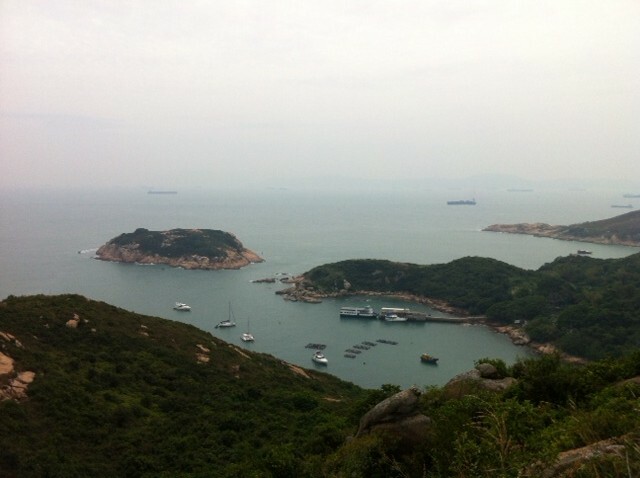 I was so smitten by the scenery and had spent longer time than expected on the route taking photos and resting that I decided to go the easier route – I did not want to miss the ferry scheduled for 4pm leaving the Island. It took me two hours in total to reach the pier again when it normally takes 1.5 hours. If you go the longer route, it will be about 2.5 hours in total. 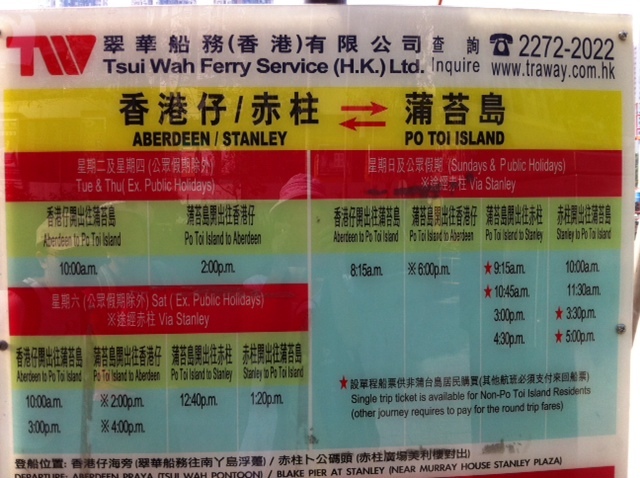 The ferry service to Po Toi Island is provided by Tsui Wah Ferry (tel: 2272 2022). You can call the company if you have any question. 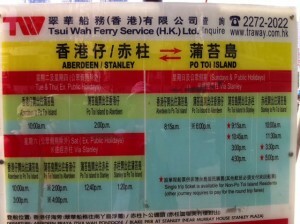 Ferry time from Aberdeen to Po Toi is one hour and slightly shorter if it is between Stanley and Po Toi. 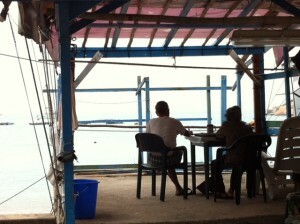 I spent leisurely time in a small dessert restaurant near the pier after 2-hr walk. The restaurant was run by an old lady who made and sold really delicious bean soup and who has lived on the island for most of her life. Must not miss her green bean soup and purple rice soup. 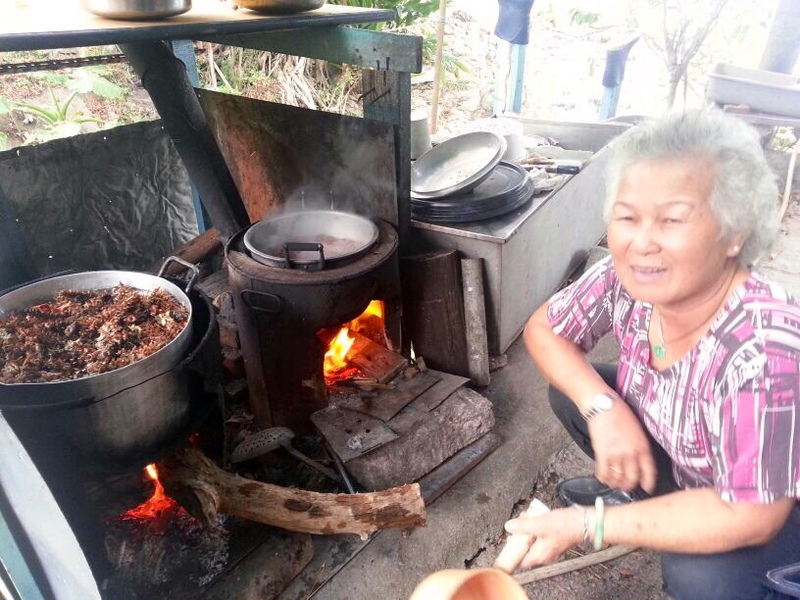 She made the dessert using wood fire. “The gas is so expensive. I cannot afford it. 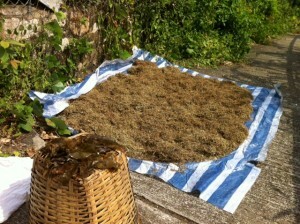 I just use the wood collected from the hill.” She said. She said she had been making bean soup for twenty years and saw the spike in bean price in recent years. “For all those years, I did not raise the price. I only added HK$2 to the price recently. I really put in a lot ingredients into the dessert soup,” she said. For the delicious bean soup packed with ingredients, she charged HK$12 only. You won’t find such delicious sweet with such good price anywhere else in Hong Kong. 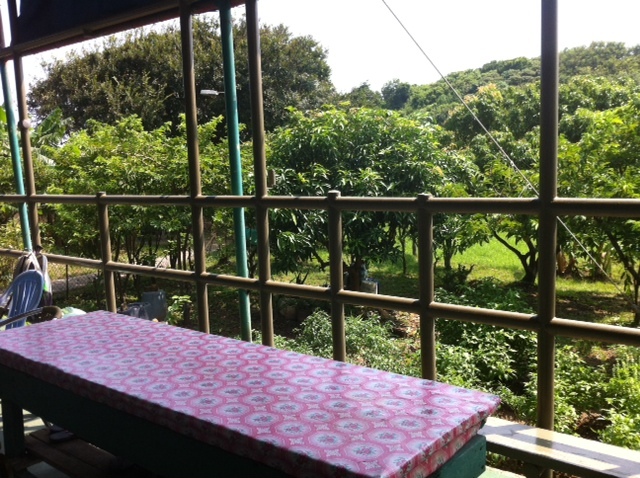 In fact, I noticed that all the dessert restaurants on the Island have similar price. 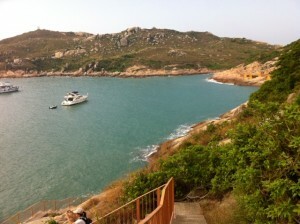 I must say, the prices on the island are very reasonable, compared to other outlying islands in Hong Kong. 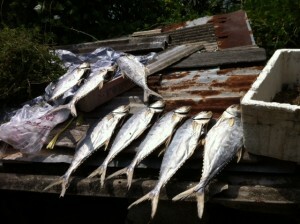 This island’s people have a touch of simplicity and sincerity. 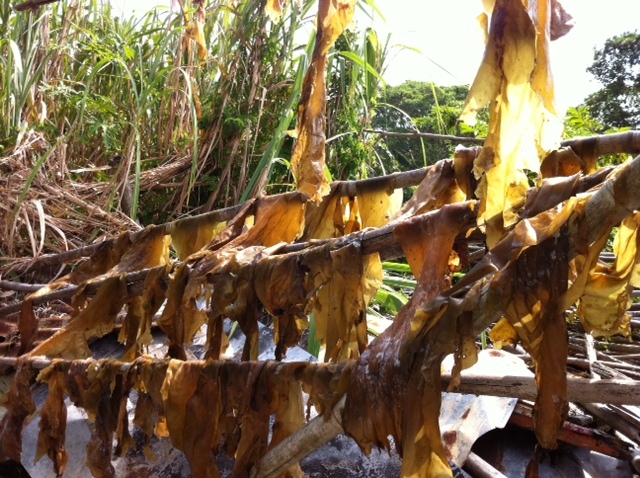 The Island is known to produce the best seaweed in Hong Kong. Green bean soup with seaweed is a common and traditional Chinese dessert and that explains why Po Toi Island has quite a few dessert restaurants with green bean soup being the main and most attractive item on the menu. 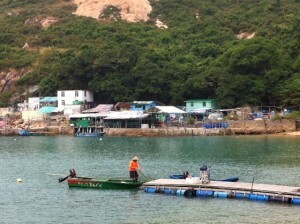 The ferry pier is near the children playground at Aberdeen harbourfront, towards the fish retail market. Ferry to Po Toi Island leaves Blake pier in Stanley near Murray House every Sunday or on Public Holidays. 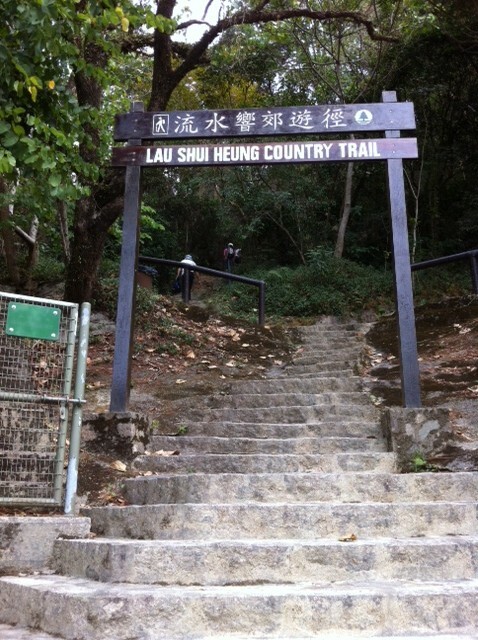 This hiking route comprises section 8 of Lantau Trail (鳳凰徑) from Shek Pik Reservoir （石壁水塘） to Kau Ling Chung (狗嶺涌), and Section 7 from Kau Ling Chung to Yi O (二澳）and then Tai O（大澳）. It was a tough walk because the distance is long, about 18 kilometres, and took me and my friends six hours to finish (we were slow, of course). It was tought also because section 7 had part of the trail covered in water, making it very muddy. This may be because the preceding days had been raining heavily. 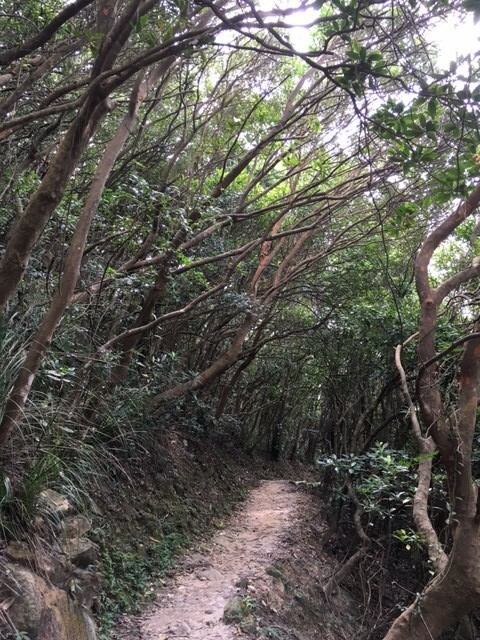 Regardless of raining or not, the section of trail leading to Yi O from Fan Lau is quite off the beaten path and is redolent of remoteness. 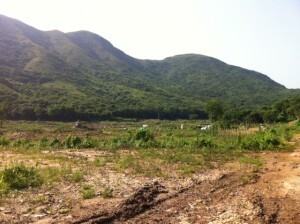 Approaching Yi O, a village abandoned since 1990’s, a sign was put up, asking people not to enter for safety reason. 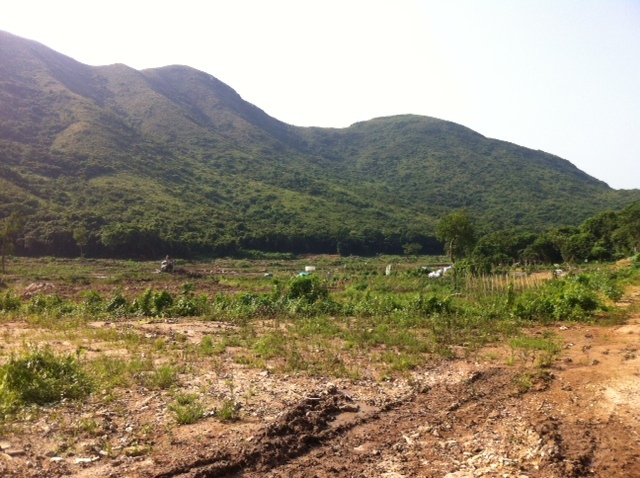 Undeterred, we pressed on, and came to the site of old Yi O village, which saw traces of construction and farming on a vast stretch of land without any trees. 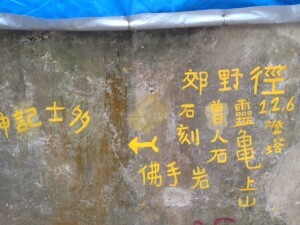 The sign was put up by the former Yi O villagers, I later learnt. They have argument with the Government over land use, and have burned down a large area of trees, avowing to stop all other people from entering their village. From Yi O, you have to pass a couple of crossroads before landing on a concrete pavement leading to Tai O. There is no signage (well, it is understood if the villagers do not welcome visitors). 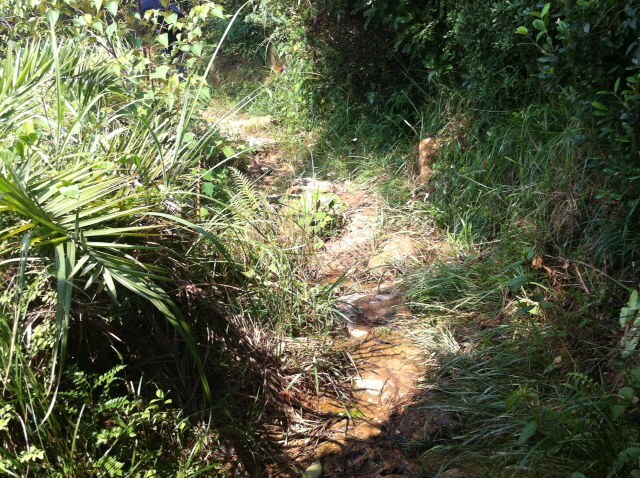 We decided to follow the path where bicycle ruts could be seen as we saw previously villagers biking. This worked and we soon left the muddy path and were on the paved way to Tai O. 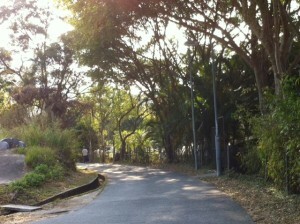 At the intersection of Yi O and the paved way is an expanse of marshes. It is starkly beautiful and quiet there. The starting section, i.e. section 8 from Shek Pik to Kau Leng Chung, is a bit boring, as the trail is mostly along a catchwater. 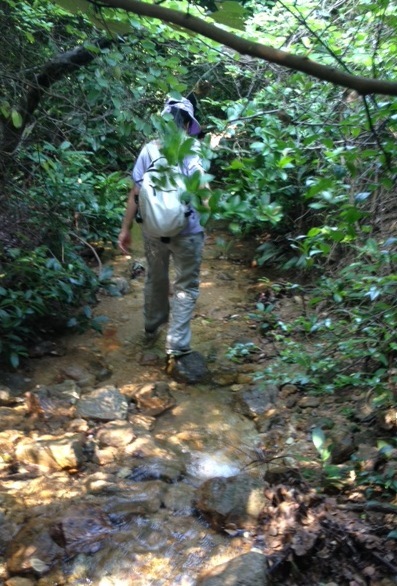 After leaving the catchwater, the walk was getting more interesting. 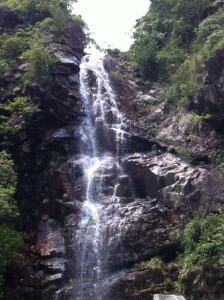 A number of waterfalls caught our attention. This hiking route’s culmination is Fan Lau, which is at the southwest end of Lantau Island and Hong Kong territory. 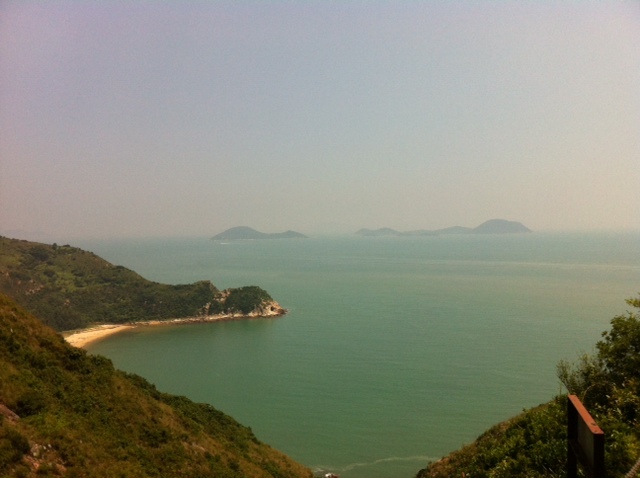 The waters at Fan Lau, a peninsula, are brown as they are close to Pearl River Estuary. 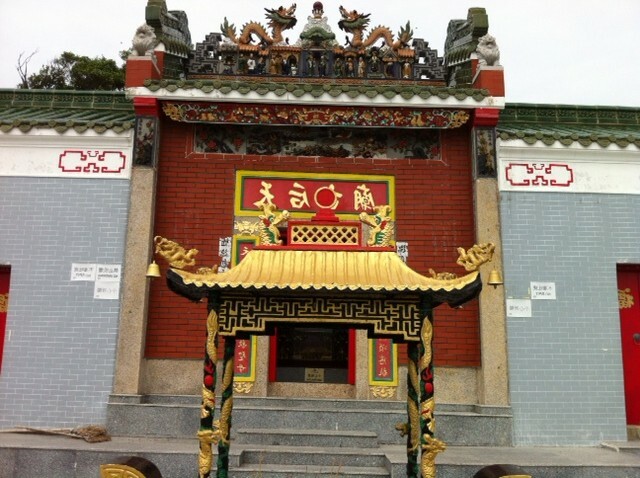 A number of sites of historic value dot Fan Lau, including Fan Lau Fort which is a declared monument and was built in Qing Dynasty for defense. 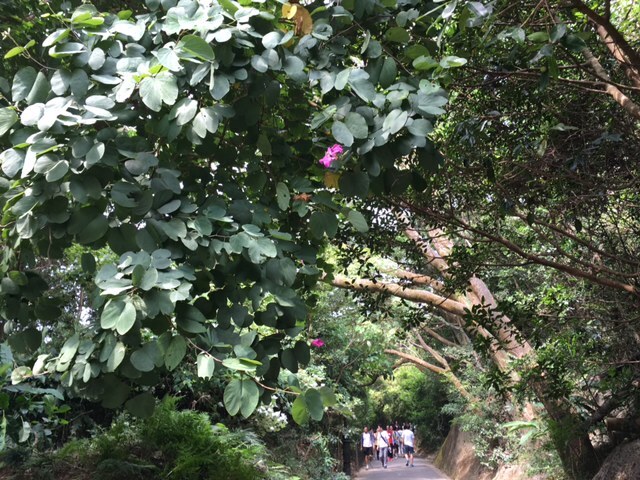 There is a hiking trail through Fan Lau, but on the day of hiking, it was such sweltering heat that my friends and I decided not to deviate from Lantau Trail to explore Fan Lau. 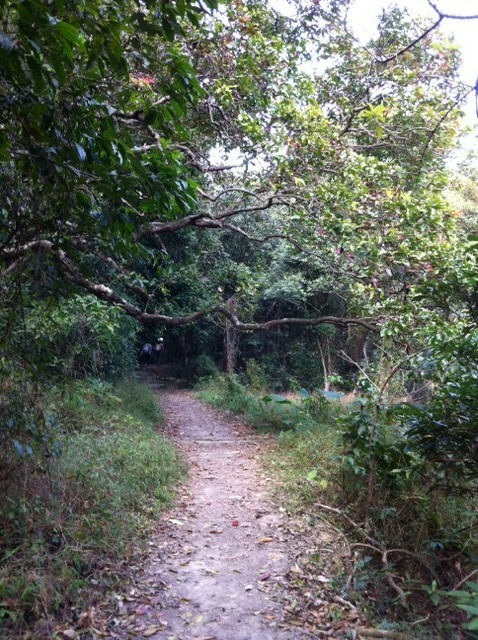 And we were very grateful that at the mostly abandoned Fan Lau Village, a Mr Chan, a retired fireman, is running a small store to provide hikers with much cherished drinks and instant noodles. Imagine no place to unwind during a 6-hour gruelling walk under intense heat. Mr Chan’s store felt like an oasis for us. The store has a nice terrace looking out to a big garden. Mr Chan grows chili in the garden and makes chili paste and sells to hikers. He also grows custard apples (番鬼荔枝) in his garden. 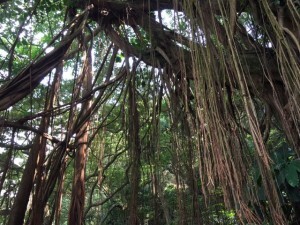 Asked why he chooses this fruit, “my mother left me with the trees,” he said. He gave each of us a custard apple for tasting. 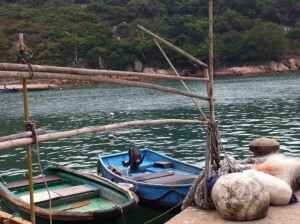 The hike ended at Tai O’s bus station. Walking on the long bridge leading to the bus station one could still see some refreshing unique scenery. It ended on a pleasant note. 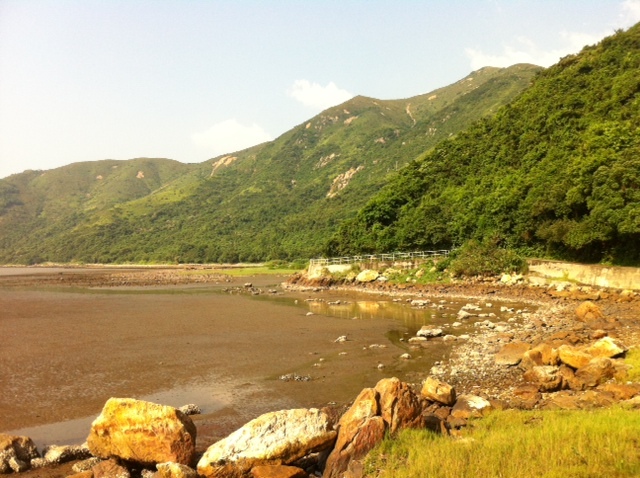 It is about 1 hour 40 minutes to walk from Shek Pik Reservoir to Kau Ling Chung, and 1 hour from Kau Ling Chung to Fan Lau, and another 3 hours from Fan Lau to Tai O via Yi O. Take bus No. 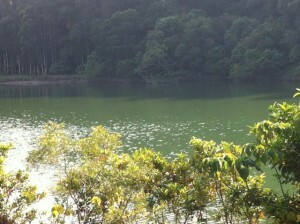 11 from Tung Chung MTR station, and get off after you see Shek Pik Reservoir. 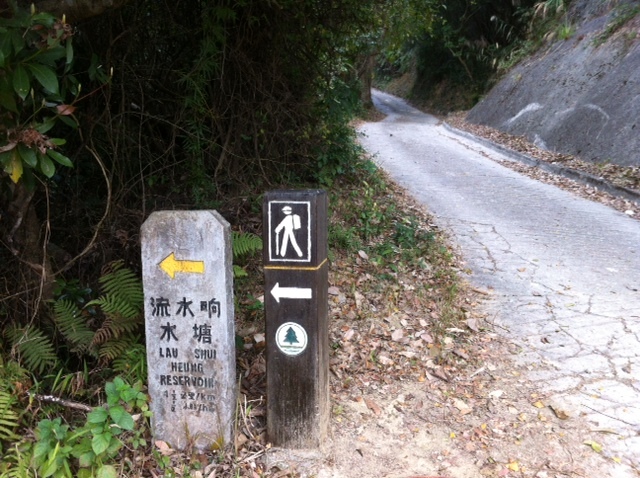 There are signs near the bus stop pointing to Tai Long Wan Tsuen (大浪灣村) and Wang Pui Road (宏貝路). 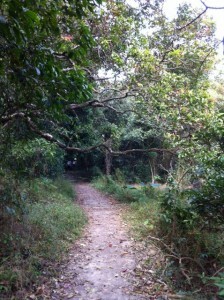 Follow the road and you will be on section 8 of Lantau Trail.